$112,895. That’s where 2019 BMW M850i starts. Hey, nobody said the new flagship coupe would be cheap. For some context, the last big V8 grand-touring coupe BMW would sell you, the 2017 650i, started at just under $90,000. That’s a solid $22,000 south of where the new megacoupe kicks off, but supposedly you’re also getting a hell of a lot more car. First off, it’s bigger. 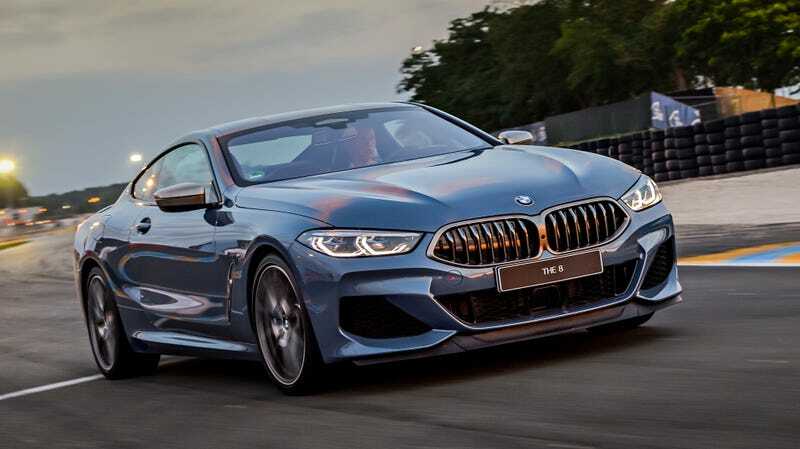 The M850i moves upmarket to compete with cars like the Mercedes S-Class Coupe and Lexus LC500, whereas the previous 6 Series was never really punching that high. You’re also getting some top-shelf equipment standard, including BMW’s LaserLight LED headlights, a sixteen-speaker Harman Kardon stereo, adaptive suspension and M-sport brakes. You’ll also get BMW Live Cockpit Professional, which I felt required to call out individually so I could address how un-creatively the company named its Audi Virtual Cockpit Knockoff. That being said, I’m all for dope driver displays that you can customize to a ridiculous degree and I look forward to spending an absurd amount of time playing with it. Anyway, you can see that BMW is throwing in a lot of their best stuff as standard which is a bit out of character for the folks in Munich. Still, the automaker mentioned some stuff that will still be optional on the M850i. Driving Assistant Professional, the company’s semi-autonomous system, can be optioned if you so desire. Jalopnik staffers have repeatedly experienced shortcomings with BMW driver-assistance packages, so we’ll have to see if the system on the M850i is substantially different from the automaker’s current offerings. You can also swap the Harman Kardon audio system for an even-more bonkers 1,400-watt Bowers & Wilkins Diamond Surround Sound system. That seems like a horrible financial decision which I would 100 percent encourage, because I’m a sucker for in-car audio upgrades. If you really hate your money, you can also throw it away on a package that upgrades the gear selector, iDrive controller, start/stop button and audio volume knob to glass. A carbon package is also available, bringing carbon-fiber trimmings to the bumpers, diffuser, mirror caps and spoiler. Finally, BMW offers a carbon-fiber roof. The press release notes proudly that this is the first non-M car BMW to offer such an option, as if that will factor into anyone’s buying decision in any way. But I forgive any and all transgressions in this press release because the M850i is really pretty. Plus, ya know, a 530-horsepower V8 is good to have. Sure, I don’t need that much power, but I also don’t need my dog, and I would die for her. And while the BMW is pricey, it’s not any more than I was expecting. If you want to get into an S-Class Coupe, you’ll be $124,500 deep from the get-go while still not offering the performance of the Bimmer. You could also get a Lexus LC500 for around $100,000, which is fantastic, but you’d be settling for a lot less speed. If you want to match the M850i for speed and luxury, you’re choices come from companies like Bentley, Aston Martin and Porsche. In a weird way, that makes it something of a value choice.